IPad mini review: In an age of larger iPhones, does Apple's small tablet still make sense? Apple hasn't abandoned the iPad mini after all. The iPad mini made a world of sense back when Apple first introduced its small screen tablet in the fall of 2012. The paperback-sized mini was ideal for digesting a novel, browsing the web, watching a movie, and, held sideways, banging out an email with your fingers. Now that Apple has unveiled a brand-new $399 iPad mini, its first since 2015, and with practically the same design as the original, does the mini form factor still make sense all these years later? The environment has changed a lot, making the case for buying one more challenging. In fact, with the emergence of phablet-sized phones, its hard to see the mini appealing to people beyond those craving a separate, smaller tablet. The displays on phones these days, many hovering in the 6-inch range compared to the 7.9-inch screen on the mini, provide more than adequate substitutes for activities you used to do on an iPad. Especially when consuming rather than creating content. While you'll appreciate the larger (but not too large) display of the mini for, say, seeing more on a page when reading a book, I still read on the phone too with few complaints. All of which is to say that while the refresh of the iPad mini is welcome and long overdue—and count me among those who like it and the form factor—many of you should not feel compelled to rush out and get one. The new mini rounds up Apple's ever more expansive iPad lineup. It all starts with the education-focused $329, 9.7-inch screen model that Apple introduced a year ago, available to schools for $299 and sometimes found cheaper than that at major retailers. (Staples this week, for example, had last year's 9.7-inch model listed for $259). That iPad is an excellent buy for the price and arguably the most solid choice for many consumers unless, of course, you prefer the smaller footprint that the mini brings. At the higher extremes, Apple sells robust 11-inch and 12.9-inch iPad Pro tablets that start at $799 and which, depending on accessories, can stretch your budget to more than $2,000. These machines, which debuted in October, are targeted at well-heeled creative professionals with cleaner designs and a USB-C connector. Depending on what you do for a living, they may even replace your laptop. For others, they're overkill. When Apple announced the new mini, it also brought out a new $499 iPad Air. It has a 10.5-inch display, but otherwise shares many of the same specs as the latest mini, including an 8-megapixel rear camera, and 7-megapixel FaceTime camera. You can get both with either 64GB or 256GB of storage; a cellular option (to complement Wi-Fi) is also available. As with each and every iPad, the new tablets run the iOS operating system and all the same apps. Most notably, both the Air and mini include Apple's own A12 Bionic chip, fortified with a machine learning neural engine that leads to smoother experiences when you're editing videos, playing a game or trying to exploit apps built around augmented reality, a few of which I tried. In one AR-based app called Jig Space, I overlaid a virtual chess board on top of the desk in my office and learned about the "castling" maneuver. 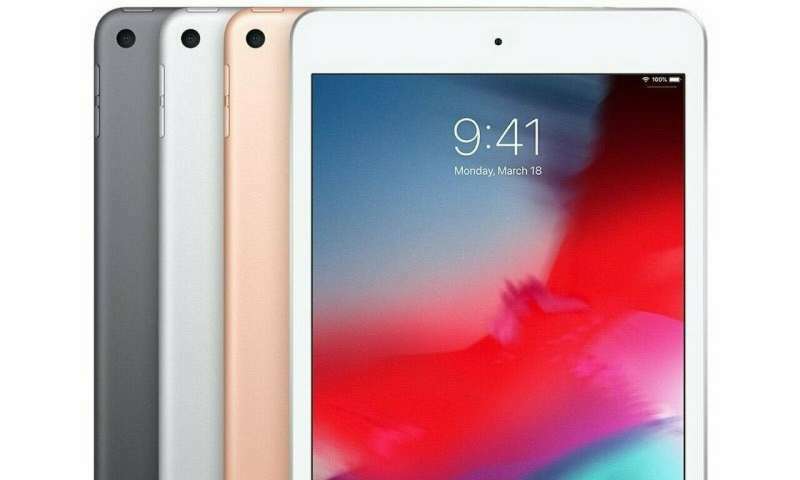 Apple claims that via the A12 Bionic, mini users will experience three times the performance and nine times faster graphics versus the A8 chip that was in the iPad mini 4, Apple's last new small tablet. For context, the chip first appeared in 2014's iPhone 6 and 6 Plus. I didn't have a mini 4 handy to compare with the new mini, but suffice it to say, given how much time has elapsed since the earlier tablet came out, you'd be disappointed if there wasn't such a substantial boost. Some other things have changed with the new mini compared with its now relatively ancient predecessor. The 7.9-inch Retina display is brighter with a broader array of colors compared with the iPad mini 4 (and yes, with this newest mini, Apple has dropped the numeral nomenclature). Unlike its predecessor, the new iPad supports the optional first generation $99 Apple Pencil stylus, which you can use to draw or sketch, sign documents, or even jot down and solve math problems through a third party app I downloaded called MyScript Calculator, handy for helping the kids with their homework. Worth noting: The mini is not compatible with the second generation $119 Apple Pencil, which only works with the latest iPad Pros and magnetically attaches to those tablets. Alas, there's no place on the mini to stash or store the Pencil. Speaking of the kids, Apple is not going out of its way to pitch the new mini to youngsters, though it will nicely fit their smaller hands and their backpacks. Apple is looking to businesses, with potential opportunities among people whose jobs have them out in the field. The mini weighs well under a pound and is roughly as thin as five credit cards. For us grown-ups, you can more easily manipulate the mini with one hand compared to a larger tablet, though my natural inclination was to still to grab the iPad with both hands. There's a huge contrast when you compare the mini to the latest iPad Pro. The latter has more modern near edge-to-edge designs. On the mini, you can't help but notice the wide bezels that border the screen, a design that screams 2012. Nor will you find the USB-C connector that's also on those latest Pros, Apple is sticking with its own proprietary Lightning connector. I will give Apple kudos for keeping here what it has done away with on the Phone. That would be the standard-size headphone jack that will accommodate those wired headphones you could have bought around the same time you last purchased a mini. When for some of you, anyway, a smaller tablet was a bigger deal.